Freshdesk Freshfone service review: can Freshfone replace Skype for Business? Our favorite help desk providers Freshdesk (albeit we only use Freshdesk for transparent email support, as we have our own bbPress based forums and never want a corporate feel to our communications or our support) have just added phone support to their helpdesk. Here's our experience setting up Foliovision with Freshfone. you can pick a number of your choice in many countries, including both our favorites, Canada and Slovakia. numbers are just $1/month and set up instantly. We snagged a great one +1 437 800 2180 with no extra fee for a memorisable number. 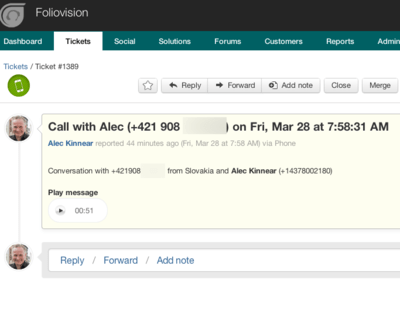 Keep reading Freshdesk Freshfone service review: can Freshfone replace Skype for Business?